Magnesium plays an essential role in your health, and you need to consume it from your diet each day. However, despite its abundance in many healthful foods, most Americans do not get enough magnesium in their diets, according to the University of Maryland Medical Center. While milk might not make for the richest source of magnesium, it can certainly help you reach your daily requirements. Magnesium is an essential mineral your body needs to maintain good health. It helps keep your immune system healthy, your bones strong and your heart beating steadily, and promotes normal functioning of your muscles and nerves. Adequate intakes of magnesium are also required for more than 300 biochemical reactions. Magnesium helps regulate blood sugar and blood pressure. In fact, people with a diet high in magnesium-rich foods have lower rates of hypertension, according to the Office of Dietary Supplements. How much magnesium you need each day depends on your age and gender. Recommendations are based on the Dietary Reference Intake guidelines provided by the Institute of Medicine. Adult women 19 to 30 years old need 310 mg, while women 31 years and older need 320 mg of magnesium a day. Breastfeeding and pregnant women have higher magnesium requirements, at 360 and 400 milligrams, respectively. Men require slightly more calcium each day -- 420 milligrams -- while children need between 40 and 240 milligrams, depending on their age. The amount of magnesium in milk varies depending on the fat content. 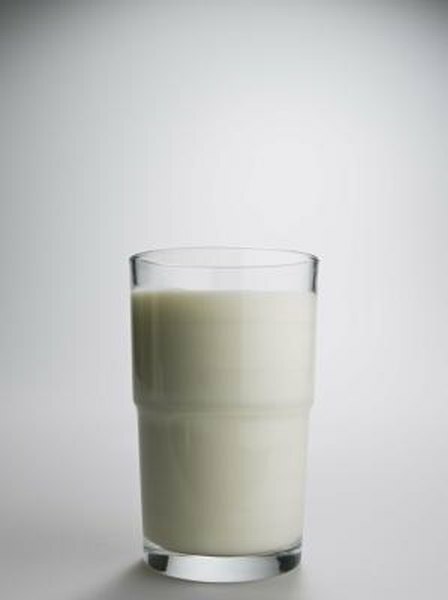 One-percent-fat milk has the highest amount of magnesium with 39 milligram per 1-cup serving. A serving of nonfat milk contains 27 milligrams, and the same size serving of whole milk contains 24 milligrams. Only the 1-percent-fat milk makes a good source of magnesium, meeting 10 percent of your daily value for magnesium, while the other two types of milk contain 6 to 7 percent of your daily value. Use milk to add flavor to magnesium-rich. For example, kick start your day by using milk to prepare whole grain breakfasts, such as oatmeal or quinoa, and add flavor by topping your bowl with nuts and fruit. Alternatively, pair whole-grain toast and peanut butter with a glass of non-fat milk. Not only will these meals provide beneficial magnesium, they'll also boost your intake of other nutrients you need for good health.